Well, I caved. I have had a fierce craving for cheez whiz for months now. I can't even tell you the last time I had it, probably not since I was a kid. I don't know why but I wanted it bad, real bad. So bad actually that I had to give in, I no longer had a choice. I know, you want me to tell you it wasn't as good as I thought it would be right? I wish I could but it was better than I could have imagined! It was so good that it only lasted a couple of days in my house, that poor jar didn't stand a chance. I had many things with cheez whiz that week including but not limited to; cheez whiz and celery, cheez whiz on toast, cheez whiz on broccoli and macaroni and cheese with cheez whiz. Please believe me and don't hate me when I tell you it was the best homemade macaroni and cheese I have ever had! Trust me, I wish it wasn't and I really wish it grossed me out but unfortunately it was unbelievable. The mac and cheese was such creamy goodness and so, so cheesy. I'll understand if you don't run out and buy a jar of cheez whiz and in fact, I don't encourage it. However, if you do, make it a small jar and make yourself this mac and cheese. Oh, and for some reason you don't feel so bad eating it with celery...gotta love rationalization. 1 454g package macaroni, cooked to package directions and set aside. Melt butter over medium heat. Add the flour and whisk the flour into the butter continuously for about 6-7 minutes (until mixture is light brown.) Slowly add the milk whisking continuously until smooth. Bring mixture to a boil and reduce heat to a simmer, all the while continuing to whisk. Whisk mixture about 5 minutes or until slightly thickened (if it gets too thick, just add a little more milk.) Reduce heat to low, add cheeses, salt, spices and dijon and stir until cheese is melted. Remove from heat and in a large pot mix the cheese sauce with the cooked macaroni, stir until thoroughly mixed. Serve immediately. I have a huge love for all versions of Mac & Cheese, even one's made with Cheese Wiz ;) at any rate -- the image looks amazing. As soon as I saw your entry on tastespotting I knew I had to find out what your "secret ingredients" were. It looked so perfectly creamy. Great photo! Every now and then I get a craving for a toasted bagel with cheese whiz, it stems from childhood but when the craving strikes I just can't say no. I'm worried this post will incite one of those cravings. 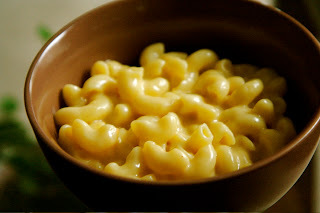 While I'm at it, I might as well make this mac and cheese! Wow. I've never made mac&cheese with cheese wiz. Hmm this could be veryyy interesting! Interesting yes, delicious OH YES! So, if you add goat cheese to the standard blue box mac n' cheese, you dont have to be embarrassed that you are eating something from a box. Its actually really tasty that way! mmm, I've never thought of goat cheese before, sounds good! You know what else is good with boxed mac and cheese....cheez whiz! I've never thought of using Cheese Whiz for mac 'n cheese, but why not? I sometimes use Velveeta blocks but I'm a little embarassed to admit it. i'm actually not usually a fan of mac and cheese, but this sounds really really good. good job! Haha Sharon! I love it! I know, I'm slightly embarassed about the Cheez Whiz too but sometimes you just can't deny guilty pleasures. And, I don't dare buy Velveeta for the fear of eating it all in one sitting!